I saw this trailer a few weeks ago while watching previews at another movie. I almost jumped out of my seat with glee at the prospect that we get to continue the story of the mysterious Alejandro, the supreme Mexican hitman and cool as ice spook Matt Graver as they work to institute control over the goings on of the notorious Mexican cartels. I can’t remember how I even came across “Sicario “>Sicario” and I remember being hesitant in watching it due to the graphic nature of the opening scene. I pushed through it and to my pleasant surprise, I knew I had stumbled onto a cult hit that simply wouldn’t be as widely appreciated as a “Mission: Impossible or “The Bourne Identity based films. And don’t even think about comparing it to a James Bond film. But that was just it…it was a niche film that had action, drama, conflict, moral dilemma and serious expose of what probably happening in certain parts of the world that we simply don’t want to believe. It was a cool flick overall and it introduced me to the works of Denis Villeneuve who is slated to helm the latest effort in the upcoming series of “Dune” movies (read about that here). this fact has instilled confidence that “Dune” may have a shot this time around if the creative folks are left alone to do their work. That’s another rant though. Emily Blunt as agent Kate Mercer gets into the action while the spooks look on. In the last film, we see wary but outclassed FBI agent (Emily Blunt) lured into a world of espionage for reasons she’s not quite sure. She meets the mysterious Alejandro and C.I.A. agent Matt Graver as they persuade her to come along on a mission that she thinks will help to alleviate some of the drug trafficking flowing through the United States. By the end of the movie though, and to her surprise, she finds that she’s been manipulated by both of less than ideal reasons. It was definitely a twist worth viewing the movie for but I won’t spoil it. Matt looks on with Alejandro and fellow agent Steve as they plan out a coup. 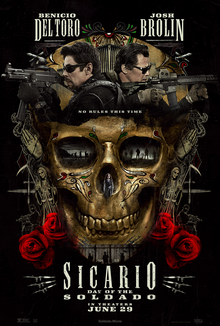 “Sicario: Day of the Soldado” takes a different turn as we find Matt Graver and Alejandro may possess different codes of conduct for how they handle things and become at odds with each other due to a surprisingly moral conflict between the two. So, partners become opponents in what looks like a fast paced spy versus hitman battle while being caught in the playground of a ruthless cartel. I don’t know, but it sounds pretty juicy to me and looks the part too. We’ll see as it’s under different direction but seems to have the same vibe. Enjoy the trailer and let me know what you think below in the comments.